By now you might have tried Wolfram Alpha, if you didn’t heard about it yet it is a new search engine launched today. While it may be good in finding answers for complex questions and displaying rich information on places and other things, it is not yet a useful search engine for average user. Of course it is intelligent and does lot of stuff, but that is not useful for everyday searcher. If you are used to use Google daily it is even better if you can get the wolfram alpha results in the Google itself. Wolfram Alpha Google is a Firefox addon that displays Wolfram Alpha results along side the Google results. 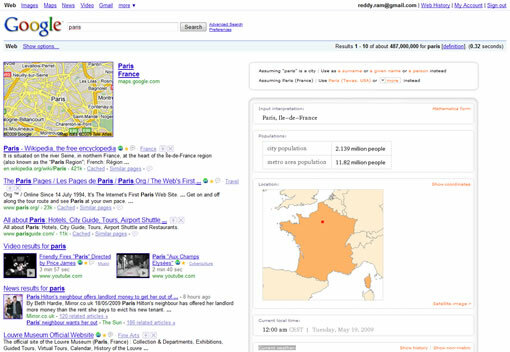 For example you search for Paris, along with the Google results you will see a frame with Wolfram Alpha result in place of Google ads on the right side of the Google search results page. This is convenient for users to get both search engines results in one page, because both Google and Wolfram Alpha are quite different in what they do. I donâ€™t know if this is legal to put wolfram alpha results in Google pages, not only that it also removes Google ads from the page. Anyway this is a good Firefox extension to have if you find any value in Wolfram Search results. there’s a similar add-on called Googlepedia which puts Wikipedia results on the right hand side of your Google searches. I think it’s much better than Wolfram Alpha for now. It isn’t a search engine. Writers betray their ignorance when they refer to it as such. Major FAIL. I did this and tried to get rid of it. Now my google is stuck on the left of the screen, vid previews dont come up and I can’t get it back. Its a good add on, but I need to be able to go back to normal google! Any help? I tried by uninstalling the addon, i dont have any problem, Google looks normal. If you have problem try to delete cache of the browser and try.